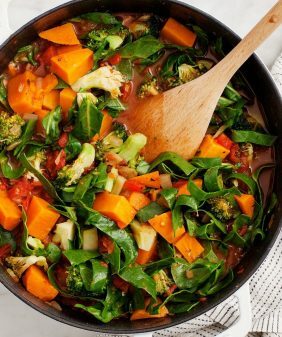 A hearty & healthy vegetable minestrone stew topped with kale pesto. Perfect for cold winter nights or make ahead lunches. Vegan and gluten free. We’re en route to snowy Chicago today and I’m trying to think warm thoughts. Yes, I grew up there, but I’m such a baby about winter. Scraping car windows, not being able feel my fingers & toes – I did it for years & it’s just not my thing. BUT I’m excited to spend a little time with my family, eat some good food, and probably cook a little. On the menu, obviously, will be warm food like this hot & hearty vegetable-packed soup. This is my take on minestrone although it’s a little less than traditional – it’s in between a soup and a stew, and it’s a little heavier on the vegetables and lighter on the noodles. It’s packed with good things like cauliflower, kale (and kale stems!). It’s especially good with the hemp seed & kale pesto I posted yesterday. Heat the oil in a large pot over medium heat. Add the onion, carrot, and a few pinches of salt and pepper. Cook until the onion is soft and translucent, about 10 minutes. Stir in the kale stems, cauliflower, and garlic. Season with more salt and pepper and cook 2 more minutes. Add the wine, stir, then add the tomatoes. Simmer for 8 minutes. Add the herbs, broth, pasta and chickpeas and another few pinches of salt. Simmer until the cauliflower is tender, about 30 minutes. Season the soup to taste. Before serving, stir in the kale until wilted. Serve soup with pesto and chopped parsley, if using, on the side. 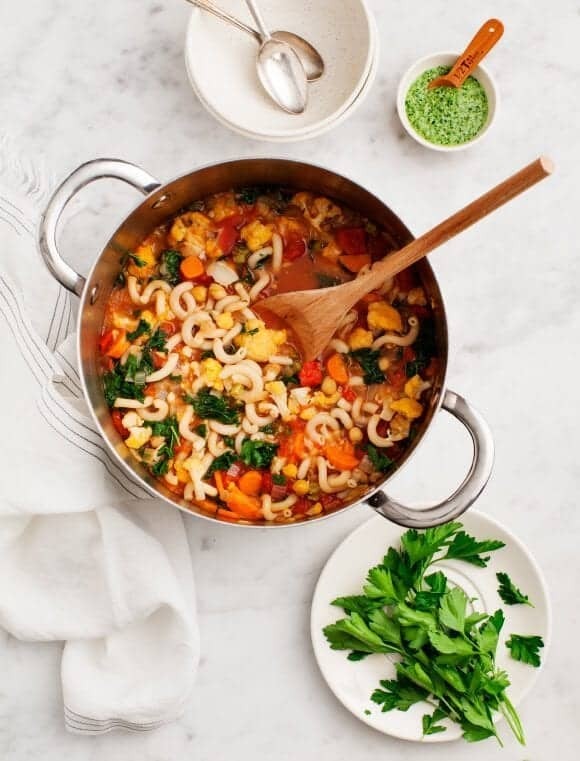 I really like your non-traditional take on minestrone, especially with that hemp seed pesto. 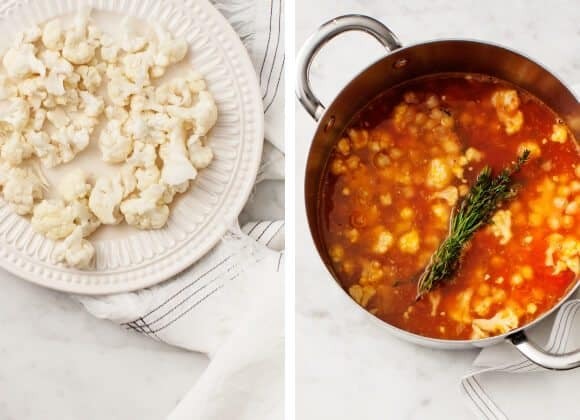 I have some leftover rosemary so I’ll be making this soup soon. As a former Chicagoan myself (but not currently residing in the warmer parts of the US), I can totally relate to your feelings about Chicago winters. Nonetheless, I hope you have a nice time there with your family. I also hope to make your `different’ minestrone soup, which sounds really good! Looks lovely but with cauliflower being 5 bucks a head & up at our produce markets at the moment, a nice root veggie (thinking celery root )will have to suffice. 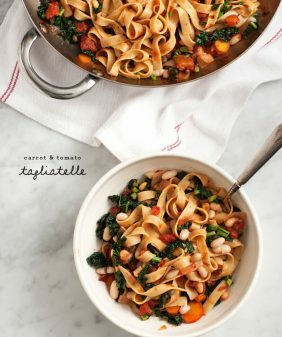 that’s so weird, I hadn’t realized that (you’re the second person to comment about it, then I googled it :)… I’ve had tons of it in my csa box, which is the same price every week… but yes this recipe is really flexible so you can sub really anything you want or just add more chickpeas. Minestrone would be perfect on this rainy day! This looks so delicious. We are expecting 2 feet of snow tomorrow in my neck of the woods and this looks like the perfect comforting thing to prepare on a cold winter’s night. I just printed out the recipe. hope you like! stay warm! This is just what the doctor ordered on a cold and windy night. Hope Chicago proves to be warmer than expected! Yes!! 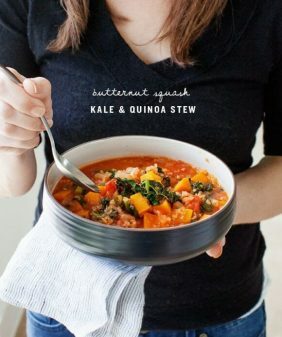 Finally a soup that takes veggies to the next level! Wow! What a creative recipe. Shall try soon. 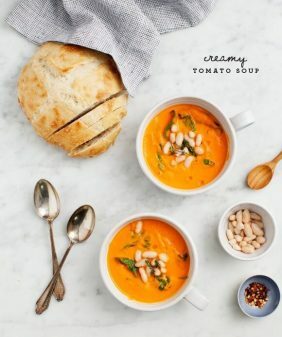 This soup looks divine and perfect for cozying up by the fire with a good book! Oh I’m a baby about winter too. I don’t mind the cold, but I hate the inconvenience. Scraping off my car, slip-slidin’ up the sidewalk, having to buy snow boots that never end up being comfy. Ugh. On the other hand, winter is an excellent excuse to make myself a wonderful batch of this soup…i adore hearty, thick veggie stews. *bangs spoon on table. When’s dinner? Ha, yep, I’m totally with you! What a warm, filling soup – this would be so delicious right now. Gotta get busy and make some soup! 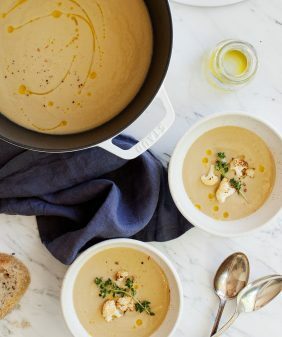 This full-meal soup was just what my family needed on this freezing winter day! My whole crew gobbled it up and the 8yo even had seconds. And you’re right about that amazing pesto – it’s delicious and oh-so-good dolloped in this soup. YUMMY!! I’ll be making this many more times. what if you only have canned chickpeas on hand, want would the amount be? just curious if using canned chickpeas, what is the amount one would use? Love it! I love chickpeas and kale and combination is amazing! As of today, this is my favorite version of minestrone 🙂 I will be definitely making this soup again. Thanx! 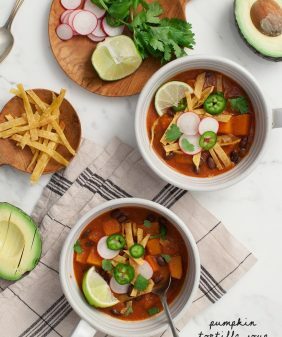 This soup was delish and easy. I used a ton of veggies from my harvest for the soup and kale pesto, including the addition of corn to the soup. Will be eating leftovers for the next few days :-). Wow! Amazingly delicious soup and pesto. I started it off with 6 strips of salted smoked bacon (not the healthiest…but so, so good), then followed the rest of the recipe. I also used a couple pinches of smoked salt. Can’t wait to use my pesto with the spaghetti squash recipe this week! Thanks! I’m so happy I found your site. Looks delicious! But I’m just a bit confused. Is the pesto meant to stirred into the stew? Serve the pesto on the side – just spoon in a scoop of pest after the soup is portioned into bowls. It adds a really delicious pop of flavor. Oh got it! Thank you! I just made this and it’s really tasty! I think I used too much pasta though. How many cups would elbows be? Also what is the serving size? I see it says serves 4 but looks like it made a lot! Hi Alyson, I’m so glad you liked it! I’ll have to give those noodles a try!